The third Ooc Om Bok Festival (moon worship festival) of the Mekong Delta will take place from October 28-November 3, according to the event’s organising board. The board said at a press conference on October 19 that, during the week, there will be a galaxy of activities in Soc Trang Province, including a “ngo” boat race, moon-offering rituals, a lantern-release ceremony, a carnival, a photo exhibition and a trade fair featuring 500 booths. 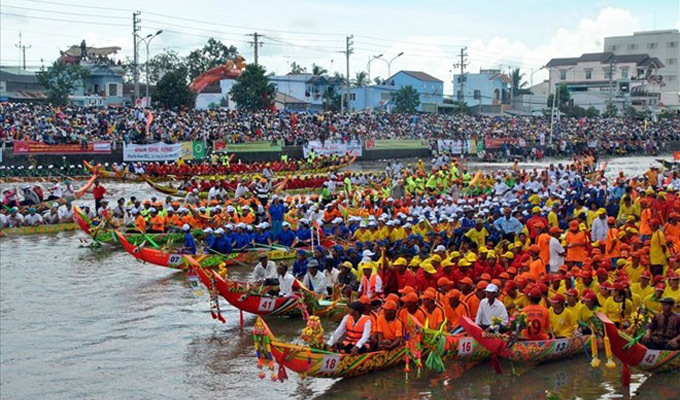 The “ngo” boat race is scheduled to take place on November 2-3, bringing together 62 teams from regional cities and provinces such as Bac Lieu, Ca Mau, Hau Giang and Kien Giang. Apart from cultural and sport activities, and art performances, there will be a symposium on tourism development in Soc Trang Province. Ooc Om Bok is one of the three main festivals – along with Sene Dolta and Chol Chnam Thmay – that Khmer people celebrate every year and take place under the full moon. The Khmer believe the moon is a God who controls the weather and crops throughout the year.